Over time, as a result of sun damage, loss of elasticity and other factors, the temporary wrinkles that form with repeated movement of your facial muscles often become permanent, causing an overall stern, tired and negative look, even when the underlying muscles are relaxed. Botulinum toxin, commonly known as Botox®, is a purified, non-animal protein produced by the bacterium Clostridium botulinum. It relaxes muscles by temporarily blocking nerve impulses when injected into selected muscles, reducing muscle contraction that causes lines and wrinkles. The result is a perfectly smooth, refreshed and youthful appearance. How does it Botox® work? Once injected into the muscle, the product is quickly absorbed and directly inhibits the transmission of signals between nerves and muscles, ultimately preventing the muscles from contracting and forming undesirable lines and wrinkles. The process takes as little as 15 minutes to complete and there is no downtime, since discomfort is minimal. Effects can last up to four months and, since this is a temporary solution, the best results are achieved when Botox® injections are used in combination with dermal fillers in a comprehensive and personalized treatment plan. Our experienced doctors and medical professionals are committed to achieving the most natural-looking results, for full facial mobility and smoother, refreshed skin and a younger, well-rested look. WHAT CAN A BOTOX INJECTION CORRECT? Forehead lines also known as ‘worry lines’ are horizontal lines produced by the frontalis muscle in the forehead repeatedly lifting the eyebrows. These wrinkles usually appear in people in their forties and above, and are more pronounced if you have low brows and excess upper eyelid skin. Frown lines the vertical lines between your eyes, also known as ‘glabella lines’. Repeated muscle movement and contraction leads to permanent static wrinkles. Crow’s feet the fine wrinkling lines radiating outwards around the sides of the eyes, formed over time by squinting and smiling. Bunny lines also known as nose lines, can appear from the constant scrunching of the nose muscle. They appear as horizontal wrinkles across the ridge of the nose. Hyperhidrosis a condition characterized by excessive sweating. Commonly affected areas are underarms, hands and/or feet and the groin, because of their relatively high concentration of sweat glands. 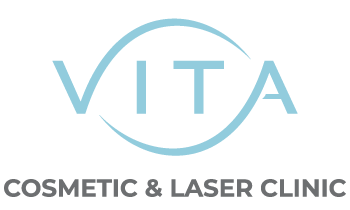 Why choose Vita Cosmetic & Laser Clinic for your Botox® treatments? Vita Cosmetic and Laser Clinic is conveniently located in the heart of Bayview Village, right across from Bayview Village Mall in Toronto, on 27 Rean Dr, unit 7. We offer the broadest range of treatments in North America. At Vita Cosmetic and Laser Clinic, we not only use the most innovative products, the latest advanced technological therapies, the most powerful equipment, we also have a highly trained team of onsite medical experts and the best injectors in North America, with over 20 years of experience in the aesthetic medical field. We are committed to continually improving and refining our services, while researching the latest advances and innovations in the Cosmetic, Laser and Skin Treatment fields. This enables us to offer both women and men the most advanced and comprehensive range of treatments and services available today, and to provide the highest standard of treatment that the medical profession can offer. Your well being is of paramount importance, and we pride ourselves in offering the very best in high-tech medical therapies from the best experts in their field. Gone are the days of the frozen forehead! Our medical practitioners are able to effectively select the correct muscles causing the lines and wrinkles and accurately administer the specific dose required to smooth them away, while maintaining natural facial mobility and expression. During an initial consultation, our medical practitioners will establish the patient’s requirements and ensure a subtle but effective result. Treatment involves a series of tiny localized injections into the muscle directly beneath the wrinkle line. Each injection causes a mild stinging sensation for few seconds in the area being treated. Occasionally, some slight bruising or swelling may occur. The entire treatment usually takes approximately 10 to 15 minutes. During this time, your practitioner will discuss the results you can expect to see and advise the number of repeat treatments suitable for you. To optimize and maintain your results, we recommend a comprehensive anti-aging skincare routine. Soften expression lines – Create a natural-looking reduction in expression lines such as smile or frown lines and crow’s feet. Restore facial balance – When professionally administered, anti-wrinkle injections can restore balance to the face. Reduce fine lines and wrinkles – By relaxing the muscle, anti-wrinkle injections can reduce fine lines and wrinkles and prevent future lines from deepening. Botox® treatments are not permanent, but they do last from three to six months, depending on the number of units that have been injected. It is important to highlight that the muscular contraction always returns with the same strength. Try to remain in an upright position for about 3 to 4 hours. Wait patiently for results to manifest. Typically, it takes between 48 and 96 hours for results to appear. It’s best to avoid harsh sunlight or strong facial preparations for a few days after receiving Botox® injections. The results can be expected anywhere between 48 and 96 hours, depending on dosage and type of injections, the severity of wrinkles, unique facial musculature, and site of action. Maximum benefits can usually be observed within 1 to 2 weeks. When you begin to notice a re-emergence of lines, it is recommended that you make an appointment for follow-up Botox® treatments. Botox® is no longer considered to be exclusively for women. Men around the world are embracing injectable cosmetic enhancements for natural-looking results. Botox® treatment has become mainstream and accessible for men, with little or no stigma attached. The motivation for seeking anti-wrinkle treatment varies among individuals. For men, the most commonly treated area is frown lines between the eyes. If these lines are deep, they can cause a person to look stressed or worried, even when their expression is neutral. Reducing and softening these lines can result in a more ‘approachable’ appearance, which can be a career advantage for many men. It has also been clinically proven to be of great psychological benefit, lifting mood and making the patient feel more positive about their appearance. If you are seeking an effective way to reduce dynamic lines and rejuvenate your natural youthful look, then Botox® is the ideal treatment for you. Your skin will look smoother and more toned, giving you a natural-looking result, while preserving normal muscle movement and facial expressions. Book your Free Confidential Consultation today and speak with one of our medical experts.